We are closed to the public during the spring and summer months, but we look forward to seeing you again this fall from September 21 through October 31. We are a family farm located just north of Lafayette, selling pumpkins and fall produce. Play in the corn or straw bale maze, and see farm animals and tractors. Wagon ride available on Saturdays and Sundays. Children 5 and under and seniors 65 and over are always free. We are a family farm located just north of Lafayette, selling pumpkins and fall produce. Wagon rides are available on Saturdays and Sundays. We do ask that you give us 30 seconds at the entrance to tell you about safety information, pumpkin prices, and other useful information. We also sell Christmas trees from Thanksgiving until Christmas. Bob and Amy both grew up around agriculture. Bob's family were in Colorado since the 1850’s where members of his family owned farms in the area. Bob and Amy were involved in farming while working other jobs and raising their family. They are both interested in introducing children to a real farm experience, as many children do not have this opportunity in their life. We try to keep your experience at the farm focused on the harvest, the equipment and the animals found on a real farm. We try to make it fun for the whole family, while we sell our pumpkins and produce. Bring the whole family for a walk in the corn maze. 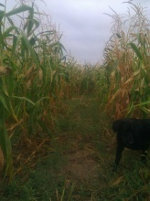 Our four acre corn maze is twice as large as previous years, and provides the real feel of being on the farm. Cut by hand, not by tractors, it allows our paths be narrower, and the experience more personal. Listen to the corn rustling in the breeze as it dries down in preparation for harvest. Hear how the corn mutes the sounds of the outside world. Let your little ones lead the way as you try to find the exit. Many people value the experience so much that they turn around and go in again. Get ready to snap some shots of your children in the straw bale maze from one of our two raised platforms. Spy on the kids, as they pretend to be lost, trying all the dead ends over and over, again. Listen to their shouts of glee when they find each other right around the corner. Borrow one of our red wagons or bring your own for a trip out to the pumpkin patch. Each pumpkin is unique and its fun to see which one each family member chooses. Tall and thin, short and fat, extra-large or extra ugly, I mean beautiful, the right pumpkin is out there waiting for you. We have pens along both sides of the farm, with animals galore. Say hi to Rocco the donkey, and Bentley the miniature horse. The chickens will be laying eggs and scratching for seeds and bugs all month long. Look at their beautiful colors. Watch the goats with their crazy antics on their climbing structure. The sheep are docile and friendly and the cows are just teenagers and spend a lot of time eating and chewing their cud. Of course we need to mention the bunnies! They are too cute for words and get constant attention from the kids at the farm. This is not a petting zoo. The animals decide whether to come forward to be pet or stay in the back to rest from so much attention. This freedom helps them to stay healthy all month while they are on display. We ask that you do not feed them anything. The steam engine is a look at farming methods and machinery from the early 1900s. We steam it up every weekend in October so you can see it in action and hear how quiet it is except for the whistle of course. Talk to Steve the engineer. He loves to talk about steam and other vintage farm equipment. Look at our display of vintage equipment. It changes every year. We offer a hayride every Saturday and Sunday in October for $3 per person. All children must be accompanied by an adult. Children 3 and under ride free with parents.You will sit on straw bales on a real farm wagon pulled by a tractor. This ride takes you around the patch and back. You will get an overview of the activities at the farm as well as a view of the Front Range with all the fall colors. Are you looking for all kinds of organically grown, winter squash, such as spaghetti, acorn, butternut and many more? These are grown right here on the farm and we also get some additional squash from Isabelle Farm which is owned and operated by our son Jason and his wife Natalie and is only three miles away. Fill you larder with fresh homegrown goodness. Winter squash and pie pumpkins keep very well and are a great choice for a winter soup, entre, pie, cake or cookie on a snowy day. No need to go to the store, just grab a squash from the pantry and fill the house with the wonderful smells of home cooking. We also have local honey from the bees kept by our son Ben from his home grown Renaissance Apiaries, as well as honey from other local bee keepers . It flies off the shelf so get yours early before we run out. All of this and more is available at our farm stand at the pumpkin patch. Make your house more inviting by tying a corn bundle near your door and putting a straw bale on your porch. Pile it high with orange pumpkins and some gourds and Indian corn. It gives a warm and natural look that celebrates the harvest as well as the season. When it gets closer to Halloween you can carve those big pumpkins for a spooky Halloween. On November first take the gourds, Indian corn and small pumpkins to inside to decorate your table and counters for Thanksgiving. All of these decorations are available at the farm stand at the pumpkin patch. Remember dont let your pumpkins and squash freeze, bring them inside on cold nights. Admission is free on Weekdays, and $5 on Saturday and Sunday. Children 5 and under and seniors 65 and over are always free. The hay ride on Saturday and Sunday costs $3 per person over 3 years of age. 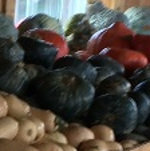 We hope you will find some pumpkins and fall produce to buy at the farm. Reservations are not required for individuals and families. For groups and school trips please fill out our fall field trip form located on the fall field trip page of the website. Our farm is geared around families visiting together. 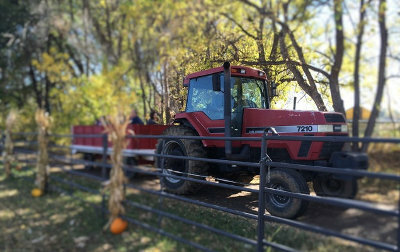 Some things you might enjoy are the straw bale and corn mazes, seeing our farm animals, taking a wagon out to the patch to pick out pumpkins for the family and taking a hay ride together. Your well behaved family dog, on a leash, can come to the farm. No dogs are allowed in the mazes. Please dont let your dog come up to children or our animals. It is very stressful for our animals to be approached by strange dogs all day. Our farm dog Cole will not be on a leash. He is a working dog and has a job to do at the farm. Do you allow birthday parties? We do not host birthday parties at the farm. Please do not bring your birthday party to the farm. Our visitors expect a farm experience, without other distractions.